Why is it that people think they know how to wire a car better than the factory did it? It amazes me sometimes to look under the dash of an old car, because you never quite know what you'll find there. 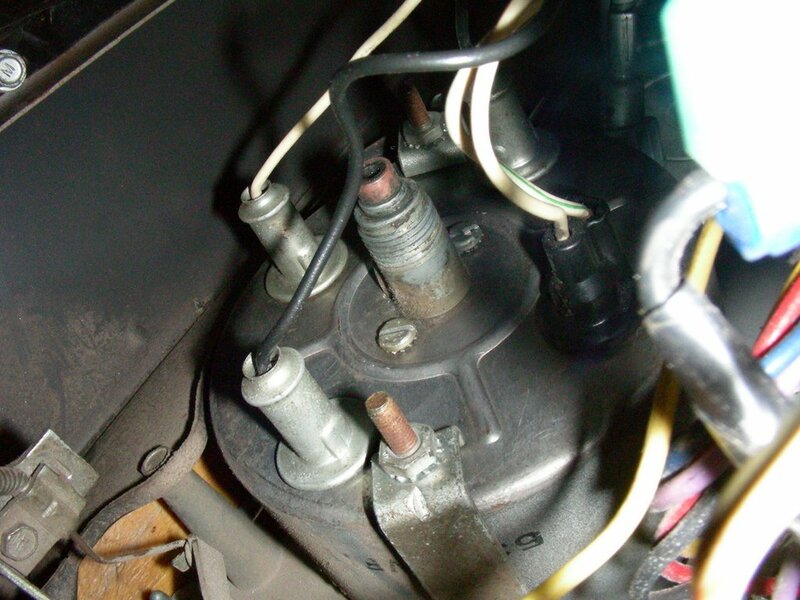 It seems to me that no car I've ever owned had unmolested wiring, and the Lark is no exception. I knew someone had been under the dash prior to buying the car, because of three things: 1) An aftermarket radio was installed. 2) There was a circuit-breaker poking out under the right end of the instrument panel (turns out it's the breaker for the wipers, dislodged from its usual mounting place next to the speedo). 3) There's a big bundle of red wires, bound with a zip-strip, hanging out from under the ignition lock, with both bare and taped-off ends. I can understand that you need to go in when you want to put in a new radio - have to find a constant +12v lead - but why screw with other stuff that's just lying there, minding its own business? The wiring harness in the Lark is pretty scary, and shows signs of at least one melted wire leading from the dash through the firewall and into the engine compartment. You can read the excruciating details of my discoveries here. 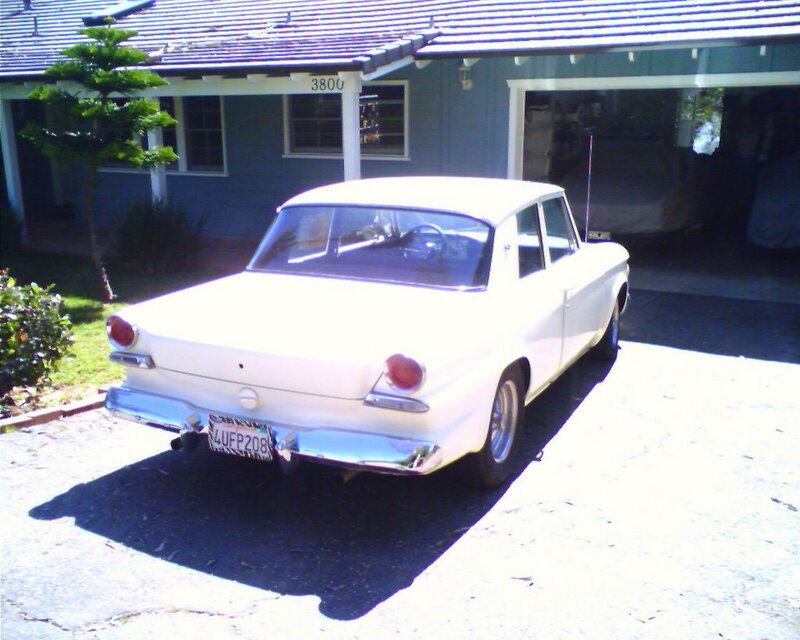 Upshot: I've ordered a new wiring harness from Studebaker West, a vendor in the Bay Area. Herman is a really knowledgeable fellow, and the harnesses he supplies are not NOS like some that are still kicking around, but are instead made brand-new from scratch. Why does this matter? My thought is that even though a harness is NOS, it's still 40-year-old NOS. It may have become brittle on the shelf all those years - a new harness, made with modern wire and modern wire wrap, applies modern tech to reliably update an old car. I ordered a front-to-back harness (comes in two pieces, like the factory: engine/dash and taillights). It'll be done in about 8 weeks and cost around $450. That's about double the cost of NOS, but like I said... And anyway, NOS harnesses are no longer available for '63 Lark V-8's, although harnesses for the sixes are. We've had our Lark for about two months now and have begun to do some work on it after assessing what's needed versus what's wanted (you know how that goes). One thing that annoyed me from the beginning was the Lark's broken speedometer. Not so good to not know how fast you're going! Upon investigation, I found a couple of things wrong. First, the speedo cable had been disconnected and was hanging from the firewall. 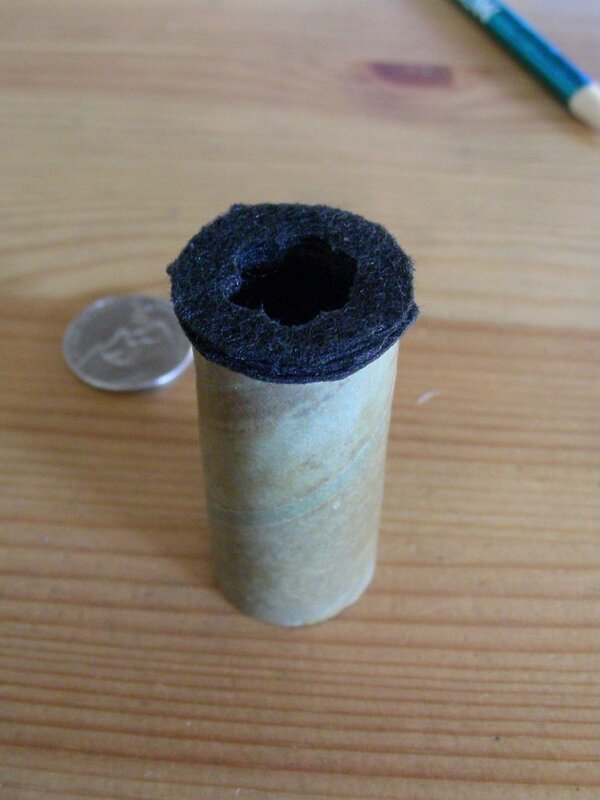 Closer inspection showed that the core - that little spring-wound flexible shaft - had been removed from the cable. 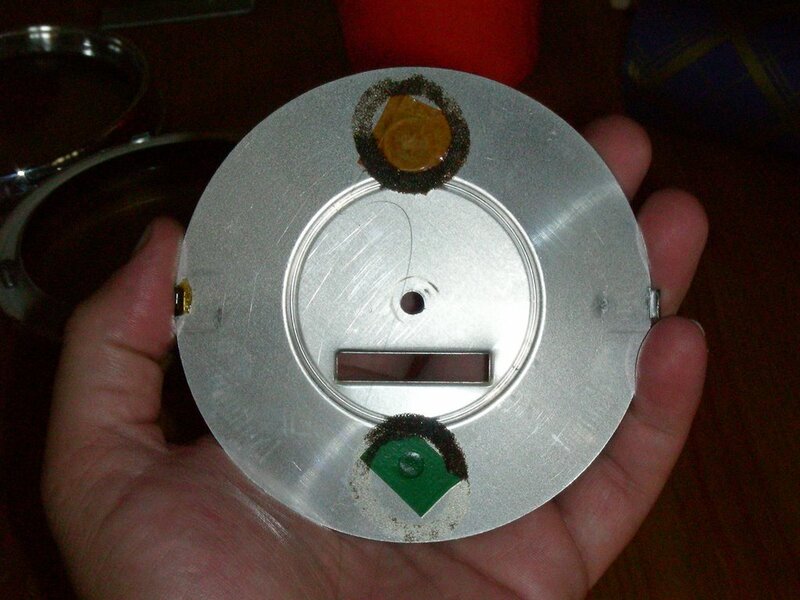 Second, I could see by examining the speedo faceplate that the needle was literally hanging from the face of the gauge, as you can see in the accompanying pic. The odometer numbers were all but illegible, too, and I knew something was wrong inside the unit. 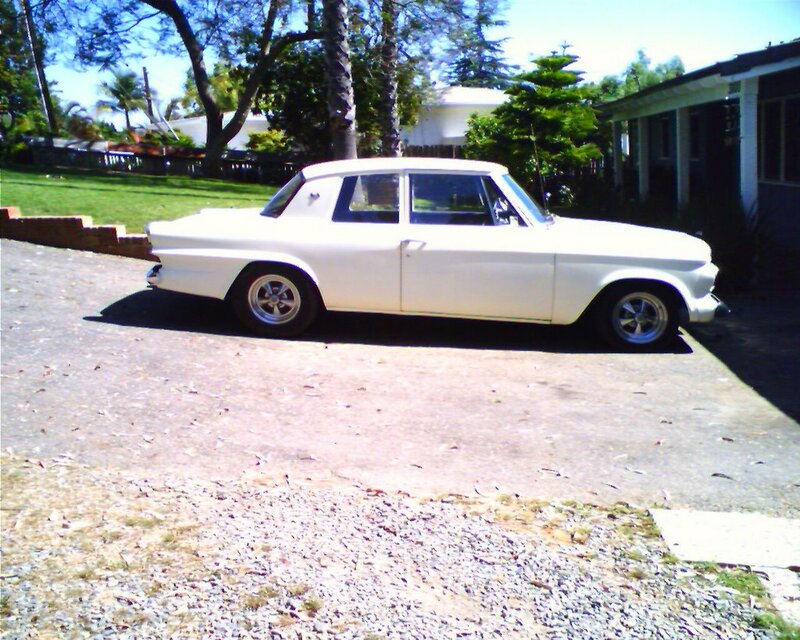 I can't say enough about the guys on the Studebaker Drivers Club Forums. I've only just begun to dig into this ark, but already they've come through with tons of information time and time again. 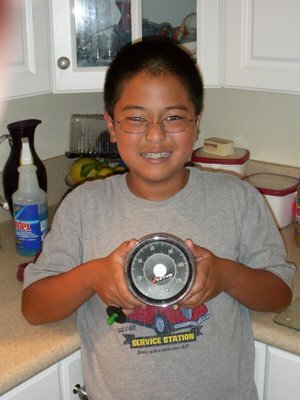 In this case, not only information, but parts: Mr. Biggs, who has an apparently limitless cache of Stude parts, sold me a spare '63 speedometer from his stash. Anyone who's ever been under the dash of an old car can vouch for the fact that it's a minefield. You never quite know what you'll find under there. Usually, there's deteriorating insulation, dust, the occasional ossified mouse (if the car was stored outside for any length of time) and lots of dust. There are also usually a good amount of raw metal edges apparently designed by the factory to shred the knuckles and wrists of anyone stupid enough to go up there! I found plenty under the dash to be scared of, but that's another story. Looking at the Lark's speedo head, it turns out to be pretty easy to remove. 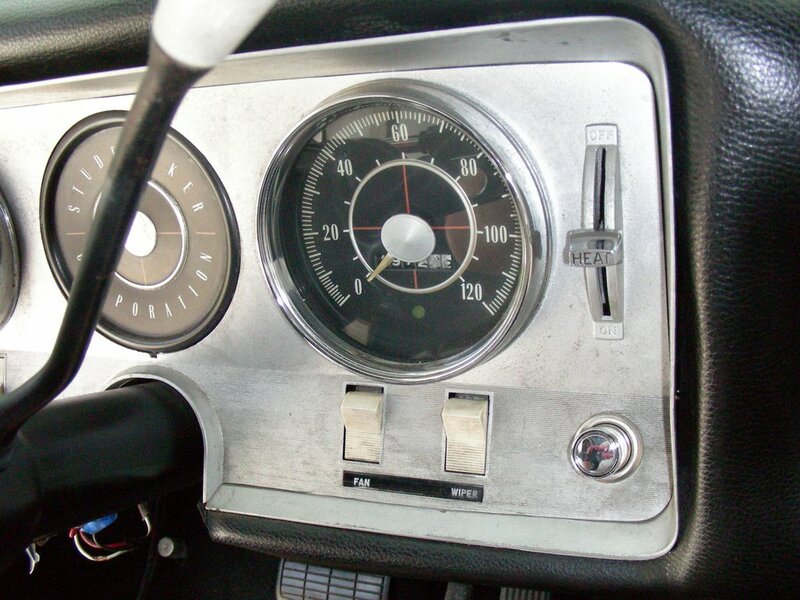 The gauges all enter the dash from the front of the instrument panel; the bezel stops them against the instrument board and there are then two L-shaped steel "angle irons" that mount to studs on the back of the instrument case and clamp it to the aforementioned panel. Removal is as simple as removing two nuts and sliding the speedo out the front. 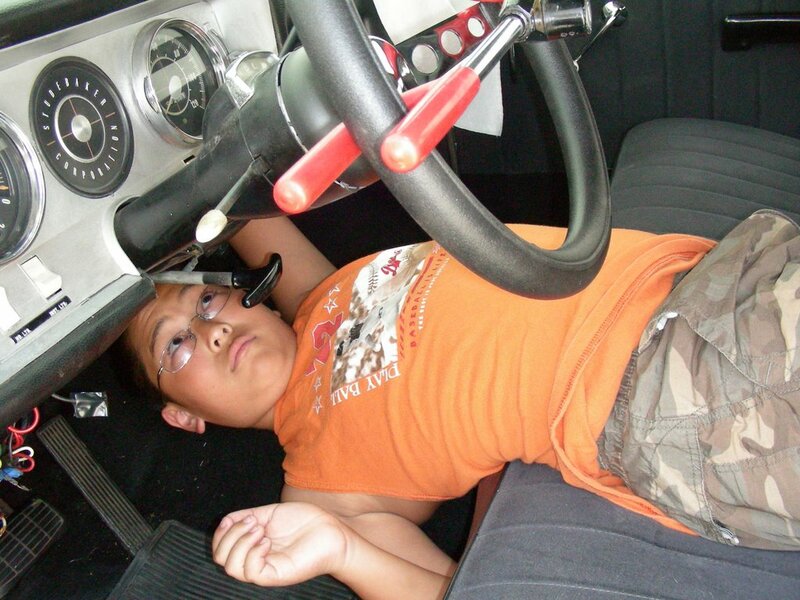 My son Reed "volunteered" to work under the dash since his arms are smaller than mine... he's more flexible, too! (This car will belong to Reed when he's of driving age. Best way to appreciate the value of an automobile is to work on it, I say.) In the photo you can see one of several bundles of unidentified wires hanging below the dash - more to come on these in an upcoming post. Using a 3/8" deep-well socket, Reed got the nuts off the mounting studs and we disconnected the lamps from the speedo and pulled it out the front of the dash. Useful note: On '63 Larks, there are four lamps in the speedometer head: a high-beam indicator, a turn-signal indicator and two panel lamps. When reinstalling, the two lamps with black wires are the panel lamps and go in the left and right mounting holes. 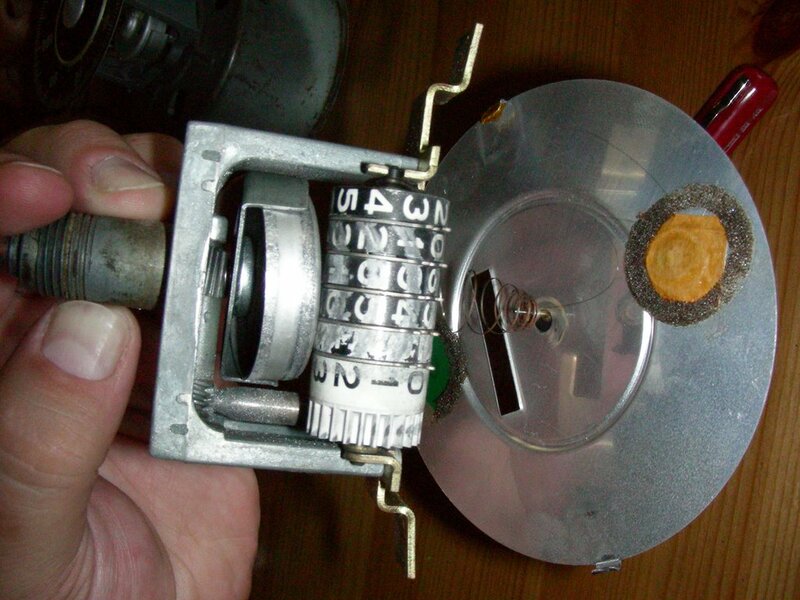 The lamp with the single white lead goes in the top hole; that's the high-beam indicator. The lamp with two leads, one white and one white with green trace, is the turn-signal lamp and that goes in the bottom hole. I was right; the speedometer we took out of the car was non-operable. Turning the input shaft resulted in no motion from the needle, so I was glad to have the replacement unit. Biggs had told me that the speedo I obtained from him would have to be opened in order to re-mount the two cardboard tubes that funnel light from the bulbs to the hi-beam and turn signal indicators. Since we're curious types and wanted to see what had gone wrong, Reed and I decided to tear open the old speedo. The assembly is held together by the chromed steel bezel, which has tabs around the perimeter that crimp to a lip on the case. You've gotta unbend these - carefully, so as not to snap them off. 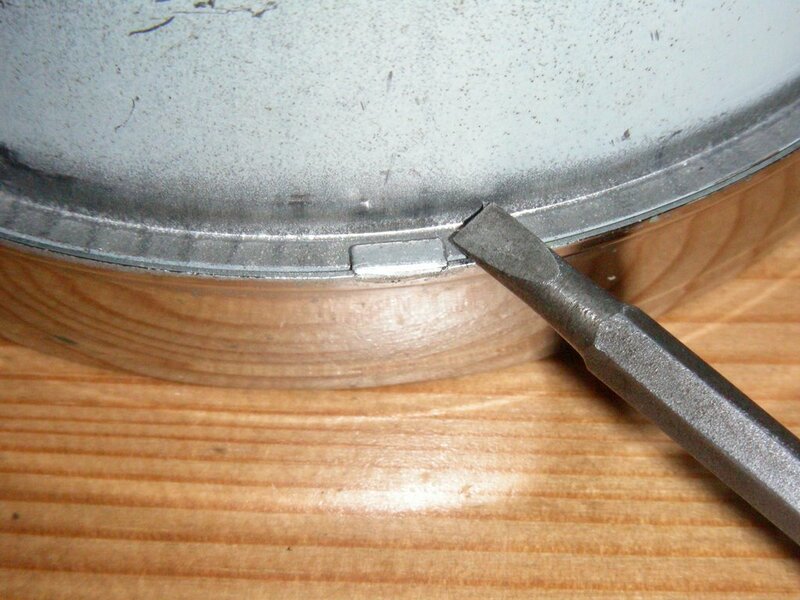 Use the edge of a standard screwdriver to gently pry up on each tab. When all of them are up, the bezel will slide off the front of the case. Careful! The glass will come with it, so don't just let it drop off onto the floor. Once the bezel is off, you can remove the mechanical assembly from the case by unscrewing the two standard screws located on the back of the case next to the cable input. The assembly slides out the front of the case. Once the speedometer mechanism is out of the case, you'll be greeted by the two aforementioned cardboard tubes, tipped with adhesive foam meant to seal the tube to the faceplate of the gauge. After 40+ years, it's a good bet that this foam will have deteriorated (like the stuff you always find in the battery case of an old radio) to a sticky, gummy mess, and the glue that held the tubes to the case will have let go. The aluminum faceplate is held onto the speedo mechanism by a two-legged bracket with foldover tabs. Hopefully you won't have to disassemble your speedo to the extent of removing the faceplate, since the needle is held on with a delicate spiral spring that appeared to be attached by having been slid inside the bushing that was then pressed onto the little needle shaft. I don't know how you'd actually get it off. As soon as we had the guts out of the busted speedo, we could see what had happened. 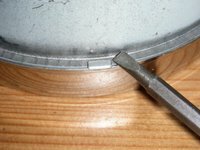 Stude speedos operate on a magnetic principle: the input shaft turns a magnet that rotates inside an aluminum cup that has magnets glued to its inside circumference. The polar repulsion of the rotating magnet pushes magnets on the inside of the cup; the faster the input shaft turns, the farther the cup rotates, which in turn rotates the indicator needle. Sometime in its distant past, the bearing on this speedo's cup had self-destructed, disconnecting it from the drive shaft of the indicator and skewing it inside the case, where it rested against the odometer reels as it rotated, wearing the numbers off the reels. The odometer still worked, since it's gear-driven off the input shaft, but the numbers were so worn it'd be impossible to say how long ago the needle assembly broke. The inside of the case was filled with metallic dust. 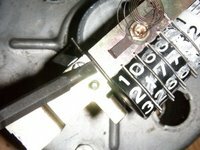 Resetting the odometer: Years ago when I was a kid, I heard news stories about used-car dealers who got busted for turning back the odometers on their vehicles. Now that I look at the guts of one of these old speedos, it becomes apparent just how ludicrously easy it is to do this. I wanted to set the replacement odometer's reels to the number displayed on the old speedo. Here's how to do it: in the picture to the right, you can see the tip of the screwdriver pointing to a spring-steel clip. Lifting this clip off frees the odometer reels from the assembly. The entire reel drops right out, and you can then rotate the numbers to read correctly. Note that the reels are separated by steel dividers with little slotted "ears" top and bottom; these ears must all be oriented perpendicular to the face of the numerals. 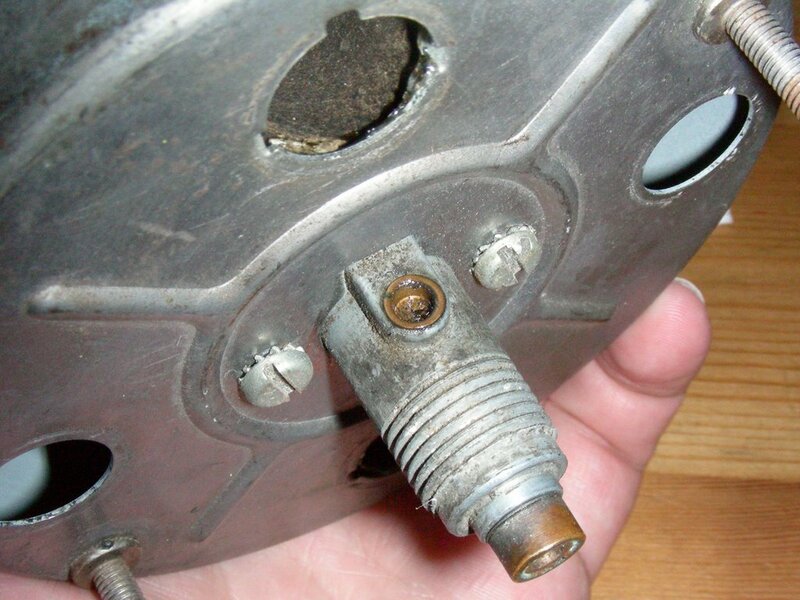 When reinstalling the reels, the slot in the top row of ears hooks to the edge of the speedo assembly. You then replace the spring-steel clip and voila! Seeing how everything worked and went together, Reed and I now opened up the case on the replacement speedo. As Biggs said, the cardboard tubes fell out in my hand when the guts came out of the case; so did the red plastic lens for the high-beam indicator. There are two "lenses" on the back of the faceplate. The green tape at the bottom is for the turn signal; the red lens for the hi-beams is a piece of plastic adhered to the faceplate with what appeared to be masking tape. We left the green tape since it was still fast, and I scraped the remains of the masking tape off the red plastic and reattached it using strips of transparent tape. The foam that sealed the cardboard light tubes to the faceplate was pretty well gone. It appeared to be die-cut self-adhesive circles originally. No way was I going to be able to source those, plus I didn't want more foam in there to disintegrate. On one of my wife's trips to Michael's, I found sheets of adhesive-backed felt and figured I could probably fabricate something from this. 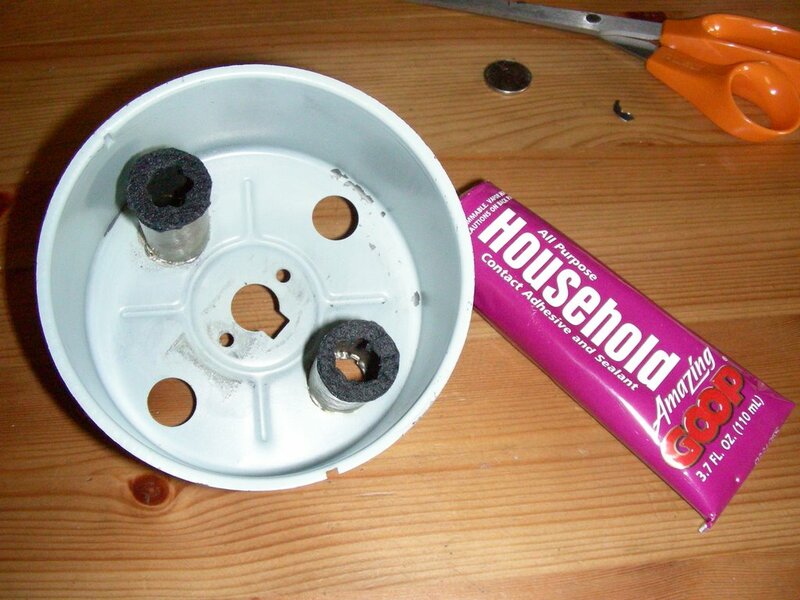 I used the outline of a nickel and cut circles from the material; it took three layers of the felt to reach the original thickness of the foam. We used a hole punch to punch out the center of the felt and then peeled off the paper and stuck the "felt sandwich" to the end of the tube. Good enough for rock 'n roll, as the saying goes. Now to cement the tubes back into the instrument case. If you look inside the case at the holes the tubes mount to, you'll see that they each have four little locating tabs. The tubes mount around these tabs. We used some good 'ol Goop to cement the tubes to the case; a hour later they were solid as as rock and goin' nowhere. We slid the mechanism back into the case and reinstalled the two case screws; the fit was perfect. Shining my Mini-Maglite into the holes confirmed that everything was sealed up tight. In cars of this vintage, instrument needles were usually painted orange. Usually, this is faded to nothing by now, and the indicator on our speedo sure was. I've found the best way to re-do these is with a Testors paint marker that you can find at any hobby shop. A couple of quick strokes and you're done. We're almost done, but the bezel needs some attention. On Studes of this vintage, it's actually a three-piece assembly: the chromed outer band, the glass, and a reflector ring. The ring is painted flat black on one side and white on the other, to reflect the light from the instrument lamps back onto the gauge face. We cleaned ours, used some Turtle Wax chrome polish on the bezel, and put the sandwich back together. 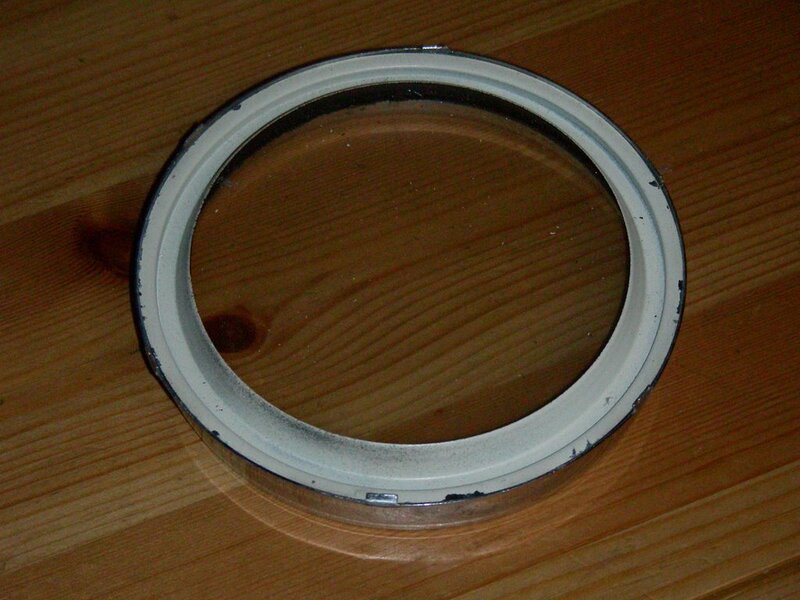 If your reflector ring has flaking paint (usually it's the flat black side), you'll need to remove the loose paint and give it a quick shot from the rattle-can before reassembling. 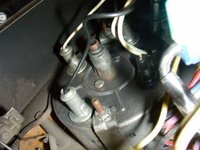 I asked the forum members about lubricating the speedo works, and was told that there's only one place that needs oiling: a little oil port on the input shaft that's visible from outside the case when it's all assembled. You can see it in the photo: a little cup with a felt insert at the bottom. It doesn't need too much oil; I filled it with about three drops of Marvel Mystery Oil (did you know they make an all-purpose lube in a squeeze bottle?) and spun the shaft by hand to work it in. Final step of the reassembly is to mate the bezel with the case and carefully bend the locking tabs back into place. Remember, go slow or they'll break right off and then you'll be cussin' up a storm. 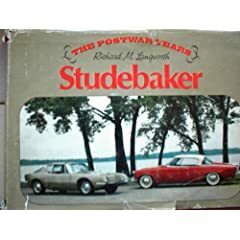 I was into cars even before I became a teenager, and one of the ones I read early on (probably at age 12 or so) was Richard Langworth's Studebaker: The Postwar Years (reprinted in the '90s as Studebaker 1946-1966: The Classic Postwar Years), part of Motorbooks' series on American cars published in the late '70s. Both editions are sadly out of print, but can be had used from Amazon for about $40. It's a slim volume, but the print is small :) In just under 200 pages, Langworth describes the incredible triumph of Studebaker's first new postwar design, spearheaded by the legendary Raymond Loewy. The dramatic Starlight Coupe with its wraparound backglass was something Americans had never seen the likes of before. Along the way, Langworth talks about the Hawks, the Larks, the supercharged record-setters, the amazing Avanti, and even the Studebaker truck line, complete with production numbers, body styles and original MSRP f.o.b. South Bend. It's a great read, and a must for anyone who's just discovering Studebakers. Before I dive into any more narrative, here's some pix of our Lark. (Sorry for the photo quality - these were taken with my cell phone on a very sunny day, actually at the PO's house just after purchase. Clix on the pix for bigger views). As you can see, it's white. I've yet to decode the trim tag to see if white is its original color; it sure looks to have been repainted but it was a very competent job - no orange peel or other paint-booth incompetence. I can tell it's a repaint thanks to the slightly errant masking job around the serial tag on the driver's door post, and due to the painted rear fender seams (these cars had bolt-on fenders at all four corners). From the side you can see the total lack of stainless side trim that helps identify the car as a Standard, and the Cragar S/S rims (a nice look on this car, I think). The rims are kluged on; whoever mounted them didn't want to spring for proper acorn lug nuts, so there are flat washers between the nuts and rims... gawd. There are some things that aren't stock about the exterior. Standards had chrome die-cast "Studebaker" script on the front fenders (in the space occupied by "LARK" ident on more upscale models) which has been removed and the holes filled (I found the masking tape on the inner fenders! ), and those crossed-flag "V8" emblems on the c-pillar actually belong on a '64 Daytona. From the back you can see another Standard hallmark: the lack of the individual chrome STUDEBAKER letters that are normally found across the trunk lid. Upper trim Larks also had a wide chrome band across the lower lip of the trunk lid, and a 4" round Lark emblem on top. The taillights at first look like '62 units. I thought that maybe Standards used the previous year's taillights, but I've since found out different. It looks like the PO who dechromed what little trim there was also removed the bright "spiderweb" moldings that fit onto the taillight lenses. If you look closely you'll see there's no trunk lock (I have to order a new one) and that there's a couple of "bullet holes" on the left edge of the trunk lid. 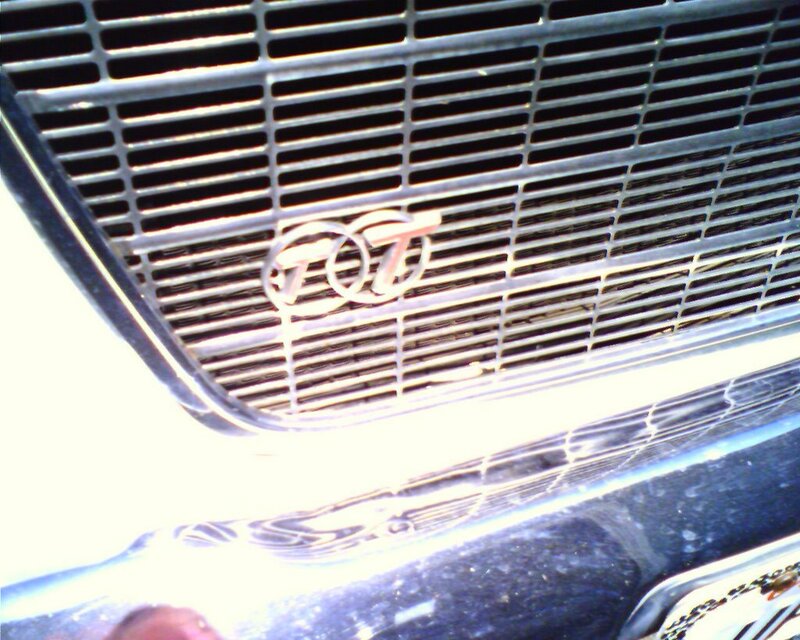 That's where the Twin Traction emblem originally went; the PO mounted it on the grille instead... Dunno why! 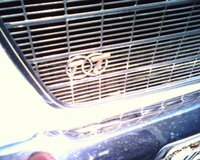 I'll be reinstalling the TT in its proper location, and removing the V8 banner from the other side of the grille - I'm told that Standards didn't have the 8 or 6 badging on the grille like other Larks. Gotta confirm this. Problem was, I couldn't get that car out of my mind. With all its flaws, it was still a great little car, and a very unique ride. My wife and I went back for another test drive. She actually got behind the wheel and ran it around a parking lot, and told me "go for it." So I did. Now for a little about the car. With the help of the great guys on the forums at the Studebaker Drivers Club, I found that the little 2-door is actually somewhat of a rara avis as Studebakers go. Its data plate reads "F2", which identifies it as a Lark Standard. The Standard is unique because it was only available for the latter half of the '63 model year. Initially conceived as a fleet model (government cars, company cars, stuff like that), it was the lowest-priced, most stripped model in the lineup. 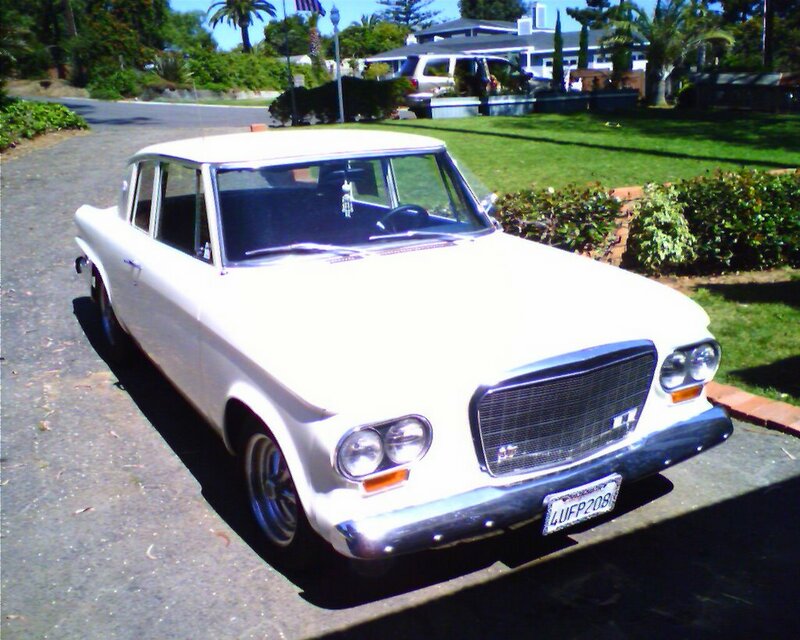 Studebaker was having a terrible year in '63 - their worst sales since 1956 - and thought that adding the Standard trim level to the lineup might boost sales to cheapwads and penny-pinchers. Standards came without a lot of the little niceties and trim items found on even the formerly bottom-0f-the-line Regals - things like hood and deck lid ornaments, side trim, nameplates and stainless windshield surrounds. They even deleted the glovebox, going instead with a plastic bin that filled the hole where the glove box would have been. A 2-door Lark Standard sedan was the cheapest model in the Studebaker line for '63, with a base price of $2,070 for a V-8 model. It was also the lightest in the lineup, with a curb weight of just under 3000 lbs. Not many were sold to the public. All of which makes our Lark a little more rare, since it was ordered with several extra-cost options, like a 4-bbl carb, heater/defroster (Studebaker called it a "Climatizer"), an automatic transmission and a limited-slip Twin-Traction rear end (a locking Dana 44). I have the feeling that the original owner was attempting to build a budget hot rod! Coming next: pictures and condition. 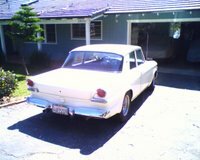 So I bought a Studebaker. Yes, I know... silly, wasn't it? My brother Richard Johnson, a notorious gearhead who ran a well-known speed shop in North Hollywood called "Fiasco Automotive" when I was a kid, also contributed. 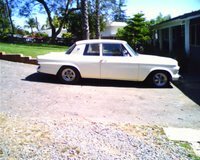 He was always coming by the house with a blown cherry-red hearse, a hotted-up Norton Commando or this amazing Olds-powered MG TD he built (clix on the pix for a bigger view). Anyway, I've always wanted to buy an old car that my son Reed and I could work on, so that he'd know the value of an automobile by the time he started driving. (He's 11 now, so we've got a few years to do this.) And we found one. About two months ago, driving down Highway 101, we saw a young lady driving a white Studebaker sedan; looked like early 60's. It sounded great and looked great too. My wife immediately loved it. We saw a "For Sale" sign in the window, but didn't get the number. A couple days later, on a hunch, I checked the online classifieds in the San Diego Union, and there it was! I called an made an appointment to see the car, and took my friend John with me. It was creaky, the front suspension was shot, and the engine had a disquieting knock in the bottom end. We thanked the owner for his time and left, not expecting to ever see the car again.